You may have noticed I'd taken a bit of a hiatus from the online world as of late. I'm happy to announce that, after a difficult pregnancy, we have welcomed our gorgeous new baby boy to our family! He is now five weeks and growing steadily stronger and sweeter by the day! 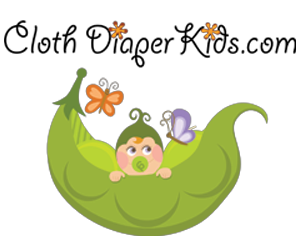 With his new arrival came night feedings, itty bitty socks and sleepers, and of course, a re-entry to the realm of cloth diapering! And after being decked out in pink everything for our first baby, it was lovely to get a splash of this gorgeous green pail liner into our new nursery to accompany all the new boyish duds creeping into our house! 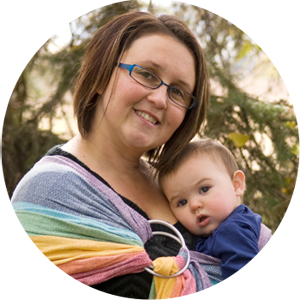 I have worked with Miranda of Calgary Cloth Diaper Depot before and am always happy to support local Canadian moms working hard to support their families! I've tried this shop's signature BambinoBUMS brand before (in diapers and wet bags) and was very happy with what they had to offer. When Miranda asked if I would be interested in reviewing another new product of theirs--this large laundry bag--I was happy to partner with her once again! Now, as far as laundry bags go, there typically is not a huge amount of variation between pail liners or hanging laundry bags. I've tried a few in my journeys, and typically most bags have an elasticized top band on the simple PUL sac. This laundry bag was different the moment I opened it up. This bag has a drawstring cinching top, which makes it easier to fit to a variety of different pail shapes and sizes (in fact, Miranda recommends pairing it with their square-shaped pail!). 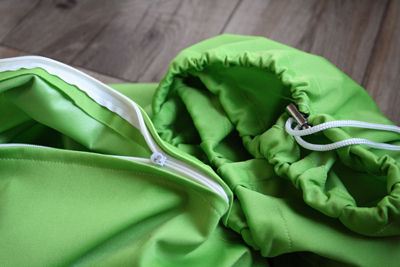 The other great thing to a drawstring is that it will ultimately hold up better in the long-run than elastic, which can degrade and stretch after many hot washes (I always launder my pail liner in the same fashion as my diapers, so it takes a bit of wear & tear!). The really revolutionary part to this pail liner, though, isn't its drawstring top (I have seen these before in other brands). No, the really cool part is that the bottom of the bag is also sealed with a zipper, which means that it can be easily unzipped to release soiled diapers into the wash! I can't tell you how many times I've gotten my hands slimed by trying to invert a stubborn pail liner into the washing machine! So far, I haven't had this happen with this bag since I just loosen the drawstring a little, unzip the bottom, toss the whole bag in my front loader, and give it a vigorous shake. 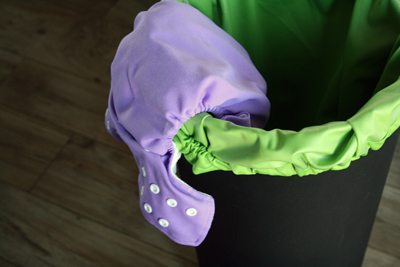 Dirty diapers easily spill out both ends, leaving my hands free of any icky rummaging duties! To those of you who have a top-loading machine, this bag would be even better. Simply hover the bag over the top-loader, unzip, and watch the diapers tumble down all on their own. I love low-maintenance solutions like this. And so far, despite my furiously heavy-wetting newborn, I have not had any problems with the zipper leaking puddles into the bottom of my plastic pail (this was an initial concern I had with the design). Overall, this is a super cool design for a pail liner and I'm really thrilled that Miranda contacted me to try out such an original product! These bags are available in punchy blue, green, and red tones and are available at a discount if you buy two at the same time (a smart idea as pail liners usually need to be rotated to have one clean one for the pail while the old soiled one hangs to dry!). Please also read below about how you can win one of these handy bags for your own nursery! 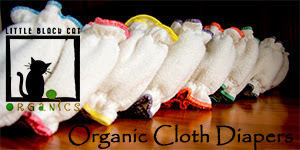 Head over to Calgary Cloth Diaper Depot right now and browse through all their cute cloth diapers & related accessories! 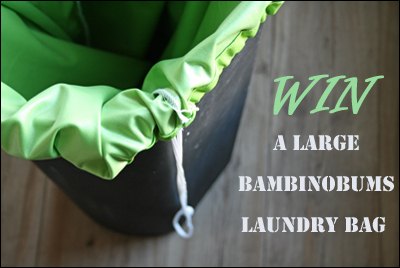 Calgary Cloth Diaper Depot is also offering one lucky winner a BambinoBUMS Laundry Bag in your choice of available color! Final details: I received this sample item free of charge. All opinions shared are my own, and I was not persuaded to share anything other than my own honest thoughts. Other users may have different experiences with this product than what I have shared. This giveaway will end on October 25, 2012 at 11:59pm MST and is open to residents of Canada and the USA only. Winner will be chosen randomly using random.org’s services. The winner will be contacted by email and will have 48 hours to reply before a new winner is chosen. The prize will be supplied and mailed out to the winner by the sponsor of this giveaway.